So this is what it’s supposed to look like! Before starting on such a huge project we talked about the materials, the techniques, the approach. We discussed how the table functions as a piece – there are two separate consoles, one with a simple drop-leaf to easily combine the two into a dining table. Roy really wanted me to make the right choices for the piece. You have inspired me. I bought a desk here in the US when I first arrived (I had no-where to write and was getting very whingey) It’s turn of the 20th Century (which is quite an age here!) but really needs to be stripped and polished. I think I will give it a go. I might get it done before it needs to be shipped to France …. That’s fantastic, Fiona. Be prepared for it to get worse before it gets better. But never give up! (Try to avoid using varnish as that’s the only thing that is really difficult to undo!) But where will you write in the meantime? I think the truth is that the desk represented my need to have a corner that was just mine in a house that didn’t feel like mine (I’m working on restoring the house my husband bought with his ex-wife 25 years ago …. nuff said!) I’ve been there longer now and I think I can cope with the kitchen table or sitting on the deck (complete with mint julep to make my F Scott Fitz fantasy complete) for a little while!! Ooh! I’m sure the mint julep would make it all OK, wherever you are! Stunning result, and so satisfying I’d think. Suspect you might now have one arm bigger than the other. 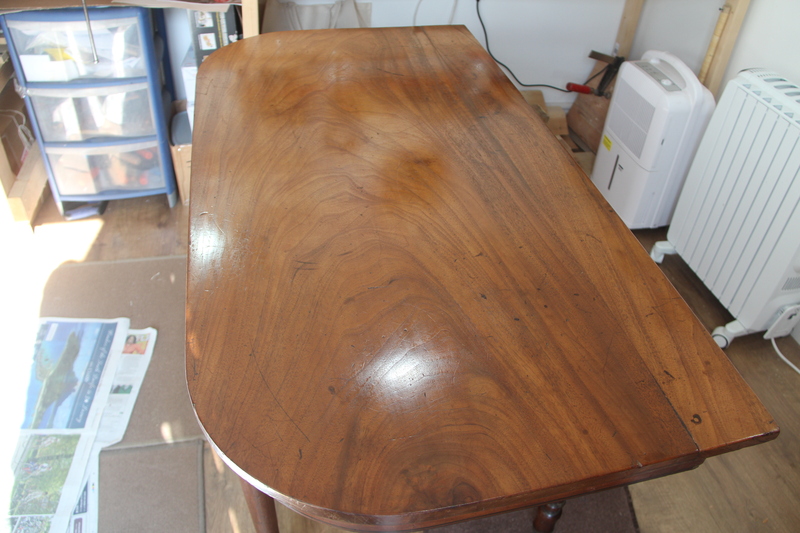 Very impressed with the determination and hard work you put into understanding the process of French polishing! Good luck with finishing the entire set of tables and let me know how it goes. Thank you, Roy. I can’t wait to get started again! Wow! What a difference! How many hours of work did it take? What did you use to strip? We used a LOT of methylated spirits and fine steel wool to clean. 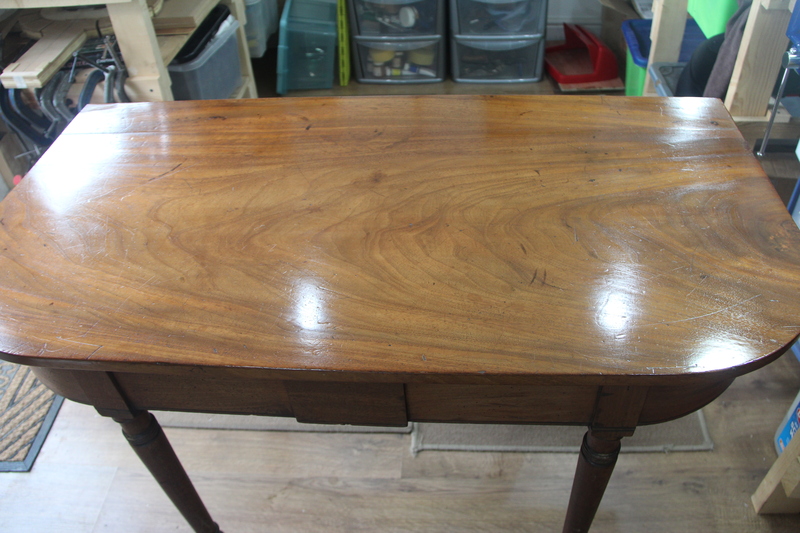 French polishing is a very labour intensive process which requires a huge investment of time, but I found I felt ‘in the zone’ doing it and the hours passed quickly. Very therapeutic! Well done you fellow furniture rescuer you!